Four years ago, nearly all the candidates in the crowded field running to replace Tom Menino as mayor of Boston sang the same tune: The city needed more housing, better schools, and a more welcoming environment for businesses and their employees. Voters chose Martin J. Walsh, a Dorchester state legislator and labor leader, to deliver on a set of concerns that drew a surprisingly broad consensus. So, with another Election Day approaching, how’d he do? On two of those three goals — housing and the city’s vibrancy — the mayor has excelled. Boston’s building boom has added so many new housing units, so quickly, that the city is starting to turn the corner on what seemed like the unstoppable upward spiral of rents. The boom hasn’t reached every neighborhood, and there’s still work to be done, but Walsh has already built an impressive legacy in bricks and mortar. The mayor also deserves credit for the new spirit of open-mindedness at City Hall, and a commitment to asserting Boston’s place as a creative global city. He’s reduced the friends-and-favorites atmosphere at City Hall, and backed efforts to liberalize the hidebound rules that stand in the way of neighborhood vitality. His administration seems more inclined to greet new ideas with open arms rather than a wary scowl. Attracting General Electric’s headquarters to Boston was a powerful vindication of the way Walsh is running the city: One of America’s biggest companies showed its confidence in Boston as a place to do business and for its employees to live. Public education is still waiting for the kind of disruption that Walsh’s administration has brought to the housing market in Boston. Walsh spent his first term mapping a pathway to improvement for the school system and has notched some victories. He implemented a longer day, hired a good superintendent, and expanded summer learning opportunities for low-income kids. The Globe endorses Walsh with enthusiasm, in the hope that in a second term he will build on his accomplishments of the last four years while using more of his political capital to improve Boston schools. WALSH’S BACKGROUND AS A LEADER of the building trades left him fluent in the language of builders and developers, and uniquely positioned to supercharge the pace of residential construction in the city. He set an impressive goal of 53,000 new residential units by 2030. And developers in the city seem to be meeting it: The Fenway, Mission Hill, South Boston, Forest Hills, and other neighborhoods have seen a spurt of new growth, with about 22,000 new units built or in progress. The good economy helped. Walsh has eased up on the subterranean politics that deterred development under his predecessor, and should continue to strive for even more transparency in the approval process. Menino allowed the perception that only his favorites could build in the city, a clubbishness that helped chill business and create Boston’s housing crunch in the first place. The new units sprouting up across the city mean jobs in construction — an immediate economic payoff. But there’s a lasting economic impact as well. By giving new residents a place to live, these units relieve pressure on existing housing stock and stabilize prices. They also mean new residents pay property tax and anchor the city’s budget. The building spree has created some tension in neighborhoods leery of extra traffic. And it inevitably leads to grumbles about gentrification. But the alternative is much worse: The city conducted a real-time experiment in slowing down housing growth during Menino’s mayoralty, and it resulted in the housing mess that’s only now coming back into balance. THE WAY THAT WALSH fended off demands that he shut down Uber and Lyft early in his tenure serves as a good symbol of another of the mayor’s strengths: He is not an enemy of change, and understands the value of embracing innovation. Early in his mayoralty, the embattled cab industry — long sheltered from competition by political leaders, even as it exploited its immigrant workforce — pressed Walsh to crack down on the popular app-based services. Politicians in other cities — New York’s Bill de Blasio comes to mind — bowed to medallion holders’ demands, and it would have been easy to imagine some of Walsh’s 2013 opponents riding to the rescue of an entrenched special interest in the city. For Boston, a city that still labors to live down an outdated reputation for insularity, Walsh’s open-mindedness has been especially crucial. So has his willingness to entertain transformative ideas — like vying for the Olympics or attracting Amazon’s new headquarters. Walsh has also tried new things at City Hall, opening an office of recovery services that’s become a national model in the midst of the nation’s opioid epidemic. It’s the sort of visionary thinking and nimble policy-making that should be applauded. In an era defined by threats of federal retrenchment, Walsh has stood up for Boston’s progressive values. On a granular level, Walsh hasn’t neglected the direct neighborhood presence that Bostonians have come to expect of their mayors — a recent poll found nearly 40 percent of residents have met him personally. Yet, at the same time, he’s not encrusted in parochial tradition: His receptiveness to change has translated into a willingness to rethink bad policies. For instance, Walsh backed an increase in the number of liquor licenses, a long-overdue reform that provides opportunities for entrepreneurs in the city’s underserved neighborhoods. The city’s future competitiveness will depend on a mayor who treats economic change as an opportunity, not a threat. WALSH MADE SOME MISTAKES.His crusade against Wynn Resorts in Everett cost taxpayers money and ended in a face-saving retreat. His promise to rebuild the bridge to Long Island was impractical, and has left him open to accusations that he broke his word. A more serious blot on his record are the two City Hall officials charged with federal crimes. The two men, Kenneth Brissette and Timothy Sullivan, are accused of using their power to force a music festival seeking city permits to hire the mayor’s political supporters. Walsh himself hasn’t been accused of any criminal wrongdoing, but his loyalties seem to be getting in the way of common sense. His refusal to fire Brissette is baffling. The trial will determine whether Brissette’s actions were criminal, but would an exoneration really mean he keeps his job? Is that all that mayors expect of their administration: simply not breaking the law? Sworn testimony indicates that Brissette abused his power; whether or not that was a crime, it should be enough for anyone at City Hall to get the boot. A better challenger might have been able to exploit Walsh’s few weaknesses. City councilor Tito Jackson has a compelling personal story and a commendable record of service in Governor Patrick’s administration and at City Hall. He promises a scandal-free administration, vows to take a much tougher approach to tax breaks used to lure companies like GE, and has made income inequality a central part of his platform. But he hasn’t spelled out a cohesive vision for the city, or translated that vision into the concrete policy proposals. IF WALSH WINS REELECTION in November, he will have a freer hand to tackle challenges like income inequality and an uneven system of public schools, which should be a pathway to upward mobility. Too many Boston children still attend schools at the low end of state rankings, despite per-pupil spending that’s among the top in the Commonwealth. Results from the most recent round of state tests, released last week, showed dozens of schools in Boston falling short. Over the next four years, the schools must show continued, measurable progress, and Walsh should clearly articulate his vision for reform. The first step is to negotiate a strong contract with the Boston Teachers Union. Walsh recently signed a short-term deal that papered over the sticking points on both sides. In the next contract, the city needs the ability to ensure that the best teachers are in the classroom, and that the system isn’t paying the salary of teachers who don’t get a classroom assignment within a reasonable period of time. Entry requirements for Boston’s elite exam schools also need reexamination, and possibly reform. Discussion of changing the entrance exam should be reopened, and the city shouldn’t brush aside concerns about the impact of the admissions policy on the racial makeup and climate of the school. The mayor wants to expand pre-K — a great goal — but that effort needs fresh momentum. He’s now angling for funding from outside the school budget to pay for it. But that may prove a fantasy. If the state won’t pony up the money, the mayor needs to be prepared to find savings elsewhere. It’s doable: Boston still spends too much on avoidable, nonclassroom expenses like unnecessary busing and outdated buildings, which could be solved by harmonizing school start times or consolidating schools. No doubt, it’ll be tough work. But Walsh’s record over the last four years should give voters confidence in his leadership. 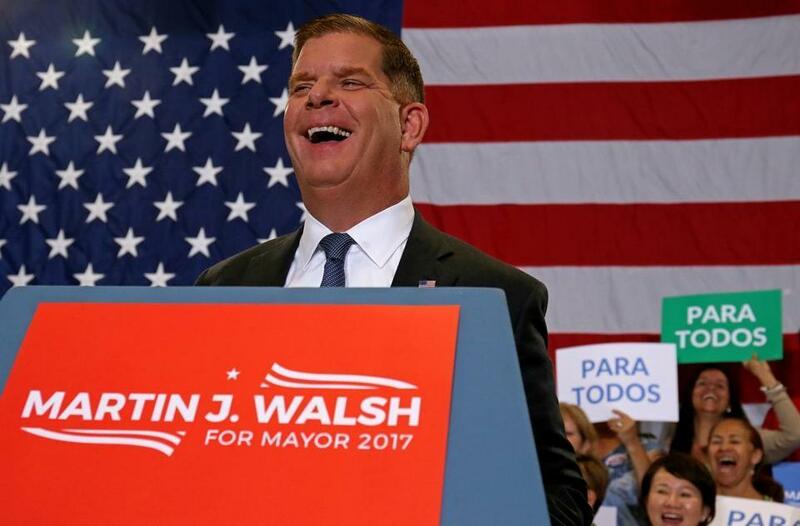 The city would be best served by Walsh’s reelection, and the Globe urges voters to pick him on Nov. 7.